The fact is not many are aware of Spain’s Holi twist, commonly called as La Tomatina before it was featured in one of the Bollywood movie, ZNMD. If you are curious to know more about the festival then welcome to this section. 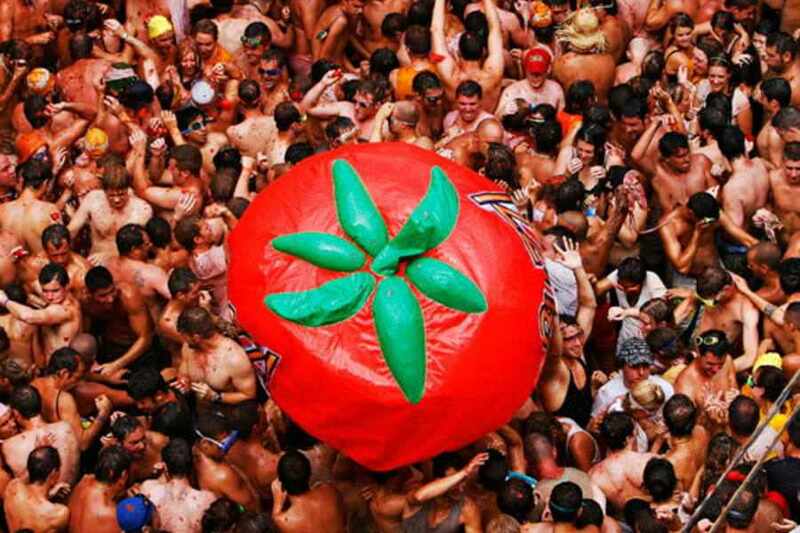 La Tomatina -What it is All About And When To Celebrate? The fight of La Tomatina Tomato happens in Bunol near Valencia in Spain occurring on last Wednesday in August of every year although the party starts at the beginning of the week. 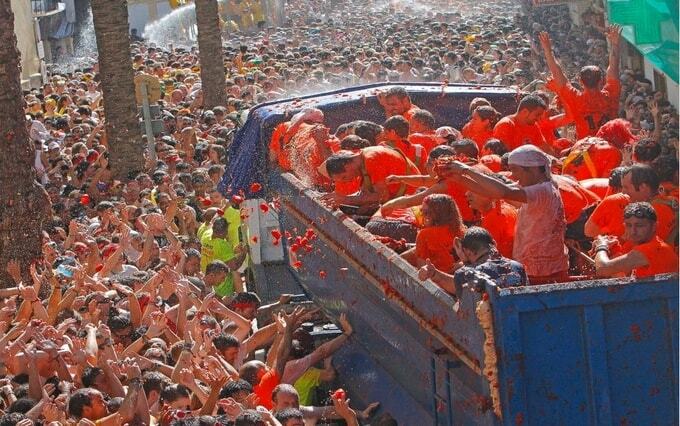 The main attraction of the festival is the fight of tomatoes, which is between 11 am and 1 pm on that day. 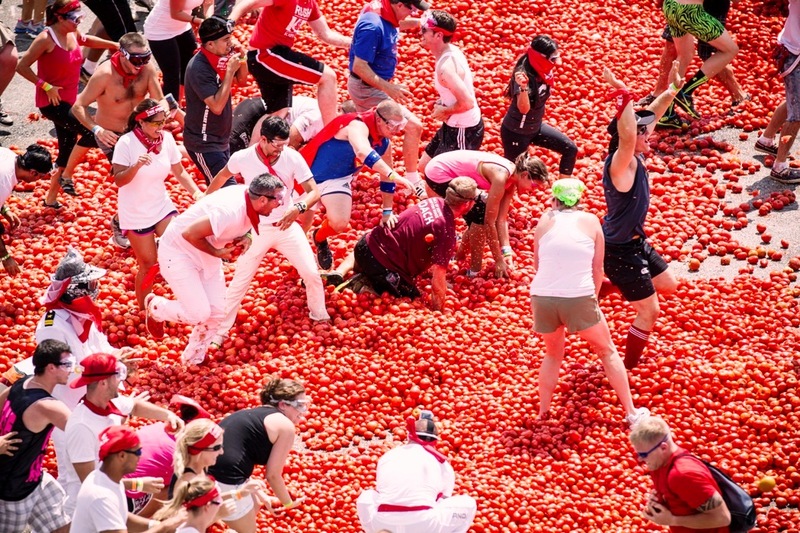 Those who take part in this celebration forcefully throw tomatoes at each other just to have fun until they are eventually sprayed by the fire trucks which drive down the roadway washing the tomato sap off the people taken part in it and the road. 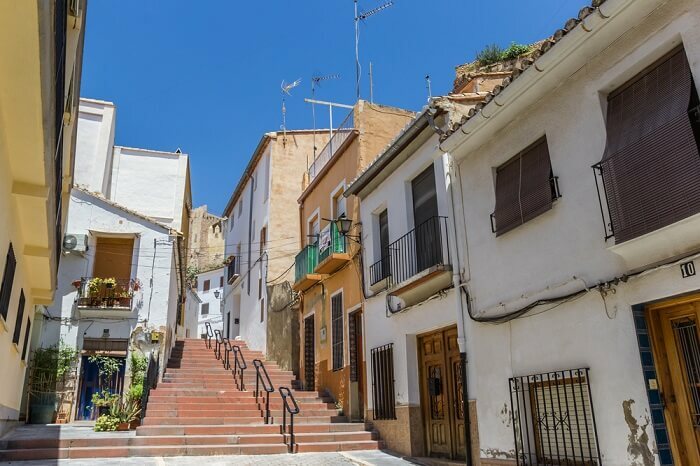 In today’s date, this event has emerged out as one of the Highlights of Spain’s Summer Festivals Calendar, with thousands of people come to this small Valencian city for this chaotic event. The next year, the young generation decided to take a fight and brought the tomatoes from the house. Although the police stopped it, boys unknowingly made the history. La Tomatina festival Spain was banned from the 1950s to the year 1957 when the tomato was intercepted as a symbol of discontent, where residents had taken a casket with a huge tomato inside it. Since the number of participants has increased every year, Tomato festival Spain was declared a festival of international tourist interest in 2002. Wednesday, August 29th, festival occur every year on the last Wednesday of August. Just book your tickets to Spain today itself to enjoy this cheerful festival later during this year. The festival takes place in a picturesque village called Bunol near Valencia, Spain. If you are planning to use a train, bus or car, then it is about 40 km from Valencia. People and locals from all over the world participate in festivals. Plan your trip to Spain to book your participation as only 22,000 adults over 18 years are allowed to participate. Whatever you wear will be destroyed so make sure you change the clothes for the return train trip or via plane. We actually found that a snorkel and mask were worth taking! After this, you can try to clean a bit in the public shower near the river, but they are usually packed. The festival starts at 11 a.m. in the morning and trucks are loaded with tomatoes continue to pass through the fight zone, where some local people throw tomato around everyone. As soon as the truck drives, people dive tomatoes to scoop the tomatoes for battle. You must stop throwing tomatoes as soon as you hear the second shot. If you want to take pictures, bring a waterproof camera! Don’t miss the Palojabon – a greased pole with a Spanish ham at the top. Interestingly, whosoever can climb the pole and get the ham can keep it!